Crop Circle Tours--Are These Crop Circle Orbs? Are These Crop Circle Orbs in this Colin Andrews Video? We were recently filming Colin Andrews talking about the upcoming crop circle tour and orb research project in July 2011. Afterwords we noticed some interesting light anomalies flickering by Colin's head at two or more points in the video. Are these orbs, balls of light, or something similar? You can see these lights at around 0:11 and 0:52 seconds in the video. These types of light phenomena have been seen for quite a while in and around crop circles. They have also been seen around aircraft going back to the "foo fighters" or World War II. They have also been seen near the Space Shuttle and the Concorde. 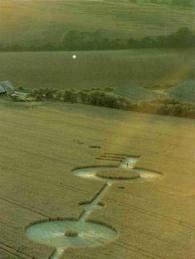 Below you can see one above a crop circle in the UK. In the past, these lights have been seen to move around and even explore crop formations. 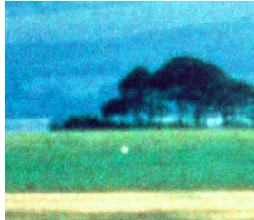 In one case, they appeared near a group of us while meditating on Woodborough Hill in Wiltshire, UK. See the picture below taken by a German tourist looking out from Knapp Hill in 1999. Do these still photos have anything to do with the lights seen in the video above? Are the orbs seen around crop circle related to foo fighters or other luminous anomalies seen around aircraft? Do they have anything to do with the balls of lights sometimes seen before earthquakes? Is it possible that just by talking about them, they will appear? Or is there another more conventional explanation for these moving lights in front of Colin's face. Take a look at the video above and decide for yourself. And if you would like to come along this summer, click the link below to find out more about our crop circle tour and research project.